We cannot emphasize enough the importance of measuring your new belt correctly. 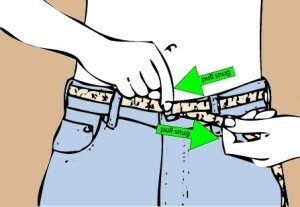 Sizing your belt is critical and is your responsibility. Remember each belt is handcrafted from the information you give us. We do not need your pant size or your waist size. If you have any questions concerning sizing, please give us a call. Mismeasured belts are not returnable. Please follow the instructions below. (If you carry an inside the Waist Band (IWB) holster you will need to measure with your holster in place). 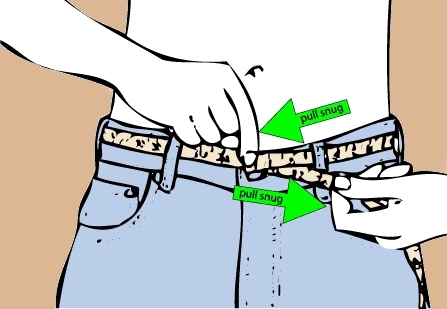 How to size your belt when ordering using a belt you already have. Measure a belt you have now from the end of the buckle to the hole you use most often (to the nearest inch). This measurement should be about two inches larger than your waist or pant size. If you are measuring an old belt that has already contoured (has that curve in the back) to your body – I recommend you use the “cloth tape measure” method to obtain the correct measurement. That curve is difficult to get out, thus you’re almost guessing at the correct size. If you don’t have a belt you can use a cloth tape measure. Put it through the belt loops on your pants and pull it a LITTLE snug.